Here’s another one of the several Indy customs figures that I had created over the past few months. The Gong Striker appeared at the beginning of “Temple of Doom”, when he striked the gong which signaled the start of Willie Scott’s song and dance. The Gong Striker stood firm at his position even as Indy’s negotiations with Lao Che went awry and pandemonium broke out in the nightclub. That was, until one of Lao Che’s sons began to shoot a Tommy gun in the Gong Striker’s direction. The Gong Striker then fled for his life. I had previously purchased the Malakili figure for possible use as custom fodder for the burly German Mechanic. But in the end I used some other parts to do the Mechanic. And so I had Malakili lying around for quite some time, until I got the inspiration to create a figure out of it. While doing my research for “Temple of Doom” Willie Scott, I was also keeping a lookout for other background characters that I can potentially customise, and I noticed among them the Gong Striker. 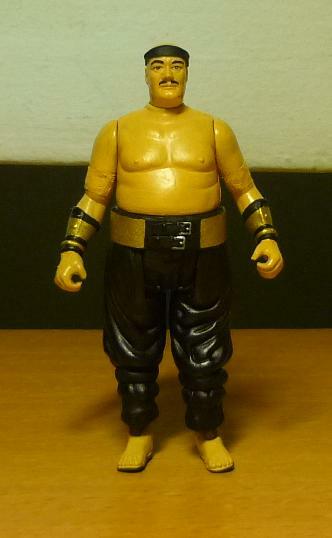 I remembered that Malakili was also a fat, bare-chested figure, and since I was doing nothing with it, I may as well use it to customise the Gong Striker. I was also inspired by Hasbro’s line of Star Wars figures, in which nearly every Star Wars character gets its own action figure no matter how insignificant its role was in the movies. The original figure was previously wearing a hood over his head. The hood was removed, and the scalp was sculpted with epoxy, with a rubber tie pasted around the head to serve as the black head band, which also cleverly covers up the seam between the head and the scalp. The moustache was painted on, and a bit of epoxy was used to sculpt the wristbands. The Gong Striker was barefooted, so the Monkey Man’s feet were transplanted over, with a bit of dremeling done to remove the slippers. The belt was made from a strip of paper, painted in gold. I had several of Indy’s holster belts as spares, and used two of them for the Gong Striker’s belt, since that belt had two buckles. And for accessory I have created a gong stick for the Gong Striker to hold. The stick was made from a plastic rod, a metal sphere from another model kit, and a spare elbow band from the Thuggee Chief Guard. The Gong Striker stands by the massive gong. Try and guess what I used for the gong in this shot. I have a rather bad habit, of trying to collect items that interests me (be it toys, books, or movies), years after their fad had come and gone, by which time now the items have usually become rather rare, and difficult, if not impossible to find. And yet my search continues, either by pursuing actively or just keeping an eye out for the items when I go about my usual hunt. 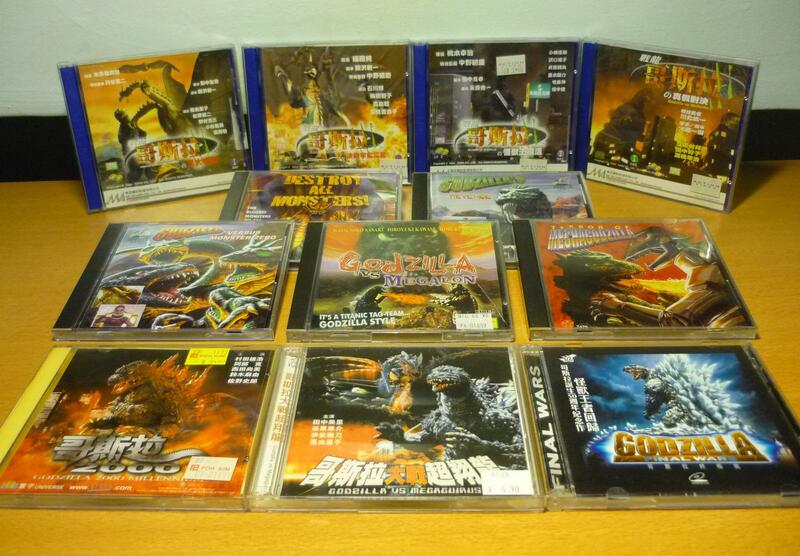 And here I showcase my quest to acquire vcds featuring the exploits of the infamous Japanese monster Godzilla. The first Godzilla movie was released in 1954. The original Japanese name of the monster was “Gojira”, with “Godzilla” being an American mispronounciation of the name which had stuck ever since. There has since been 28 Godzilla movies (excluding the pathetic Hollywood version which is universally regarded in Japan as a joke), up until the most recent movie in 2004, following which the producers decided to retire the character and allow the franchise take a break for now. 5. “Ghidorah, the Three-Headed Monster”  – VCD found ! 6. “Invasion of Astro-Monster” (aka “Godzilla vs. Monster Zero”)  – VCD found ! 9. “Destroy All Monsters”  – VCD found ! 10. “All Monsters Attack” (aka “Godzilla’s Revenge”)  – VCD found ! 12. “Godzilla vs. Gigan”  – VCD found ! 13. “Godzilla vs. Megalon”  – VCD found ! 15. “Terror of Mechagodzilla”  – VCD found ! 16. “The Return of Godzilla”  – VCD found ! 17. “Godzilla vs. Biollante”  – VCD found ! 23. “Godzilla 2000: Millennium”  – VCD found ! 24. “Godzilla vs. Megaguirus”  – VCD found ! 25. “Godzilla, Mothra and King Ghidorah: Giant Monsters All-Out Attack”  – VCD found ! 28. “Godzilla: Final Wars”  – VCD found ! From my observation, the Godzilla vcds appear to fall into two main categories. In the first category, some enterprising distributors in Malaysia had converted into vcds several of the earlier Godzilla movies that had previously been released on vhs tape. This was pretty obvious as the vcd sleeves carry the same cover pictures as the vhs. And in the second category, the more recent Godzilla movies (from 1980s onwards) were produced on vcds by distributors in Hong Kong. I have in my collection vcds that come from either categories, and I am rather convinced that some of the titles that I am missing should exist on vcds. For example, I found on the internet the vhs cover for “Godzilla” (#1 on the list), and I believe that the vcd version should also exist since the vhs carries the same “Godzilla” title card as the Godzilla vcds that I have acquired. In addition, I discovered on the internet that the HK Mei Ah Company had also produced vcds for “Godzilla vs. King Ghidorah” (#18) and “Godzilla vs. SpaceGodzilla” (#21), so I know they exist. so there’s no reason why the first title shouldn’t also exist as vcd. Notice that they have the same style of “Godzilla” title card. I now have 12 out of the 28 Godzilla movies on vcds, and my search for the other titles is an ongoing endeavour. There is just one problem, these vcds are rather hard to find now. Nowadays many video stores have already stopped selling vcds and are selling only DVDs and blu-rays. Sometimes when I inquire about vcds from the salespersons I even get a blank stare in return. The only real chance for me to find the Godzilla VCDs is on online auctions and e-shops, at flea markets or second-hand shops, or perhaps at a forgottened vcd shop in some ulu shopping centre untouched by time and progress. I want to kick myself in the leg as I had previously sighted “Mothra vs. Godzilla” (#4) on VCD at a video store, but when I returned one week later to buy the title, the entire store was gone! And I am not interested in getting any of the recent DVD versions as I still think that they are far too expensive. And why do I want to collect the entire series of Godzilla movies? I must say that the sight of Godzilla fighting against a menagerie of monsters and wrecking devastation on Japanese cities has a certain appeal to me. And while I’m still on the topic, here’s a 3.5″ Godzilla that I have acquired.